An invasive plant species is a plant that is non-native to the area in which it is growing. Conversely, native plants have occurred in their area naturally for many years, so they have a strong relationship with the environment around them. Invasive species cause harm to the natural ecosystem because they become competition for native plants. Many invasive plants were intentionally introduced to the United States for reasons such as landscaping and erosion control, however it was easy for these plants to escape those bounds to spread rapidly in nature and out of our control. Several species of Privet can be found throughout Tennessee; however, the two found most are Common privet (Ligustrum vulgare) and Chinese privet (Ligustrum sinense). No species of Ligustrum are native in the United States. These plants were introduced in the late 1800s from China and Europe to be used in landscaping and gardens. Privet spreads rapidly in both forested and open areas by seed and sprouts. They are aggressive growers and tend to form dense thickets that shade out other plants. They are most invasive in riparian areas, where they can dominate the forest under story. Privet is a semi-evergreen shrub that can grow to be 8-20 ft tall. In the late spring/early summer, privet produces small, white flowers. Fairly common in Tennessee, the Japanese honeysuckle (Lonicera japonica) is a mostly evergreen woody vine. Japanese honeysuckle was introduced in the early 1800s, as has since spread rapidly, displacing many native plants by blocking out sunlight and winding its vines around stems and trunks to stop water flow. Many animals are attracted to Japanese Honeysuckle, so it’s seeds are often unintentionally spread this way. Japanese honeysuckle is mostly evergreen and has highly fragrant flowers that bloom from April-July. Bush honeysuckle was imported to the United States in 1898. This plant leafs out earlier than most natives and forms dense thickets too shady for native plants to grow. It also tends to grow in disturbed environments, such as floodplains, and limits the amount of native plants that could resurface there. Although it’s red berries are somewhat nutritious to birds and rodents, they do not compare to the nutrition in berries produced by native plants for these animals. Bush honeysuckle is a deciduous shrub that can grow up to 30 ft tall. In late spring, the shrub produces yellow/white flowers, and it late summer bright red berries appear. When planting new trees, shrubs, and plants, it is important to avoid planting invasive species. Planting native species will strengthen the ecosystem in our East Tennessee community by sustaining native animal species and limiting the number of invasive plants taking over. Native plants have adapted to the regional conditions around them, so East Tennessee natives are able to withstand the temperatures and weather patterns in our region, and may require less maintenance and fertilizers. It is important to take the time to research different trees, shrubs, and plants before planting and to be knowledgeable about the effects certain plants can have on the local ecosystem. The Tennessee State Government has provided a useful brochure about Landscaping with Native Plants in East Tennessee that can provide more information. Join us for an Invasive Plant Removal event on May 4th! Keep Blount Beautiful, the Little River Watershed Association, Blount County Soil Conservation District, and Tuckaleechee Garden Club will be hosting an Invasive Plant Removal of the Townsend River Walk and Arboretum on May 4th from 9am-12pm. Volunteers will be removing Privet, Honeysuckle, Mulitfloral Rose, and Mimosa from the area, as well as picking up trash. For more information and to sign up, visit our website. The information and pictures in this article was obtained from the Tennessee State Government’s website. Learn more about invasive plants in Tennessee by visiting their Invasive Plants page. From childhood, we are told again and again that we need to spend time outdoors. This isn’t just something our parents chose to nag on us about though; being outside in nature has great benefits to our physical and mental health such as reducing stress, anxiety, and depression; improving concentration; improving eye health; boosting the immune system; and giving us a dose of Vitamin D. Also, chances are if you are outside you are moving around. Whether it is hiking, running, biking, or taking a walk, being outside is a valuable opportunity to get some exercise. BUT- a lot of us are stuck inside at a desk all day, so when do we find the time to get outside? It’s important to remember that getting outside doesn't have to mean traveling far, participating in an extreme sport, or spending money on equipment and rentals. Simply choosing to just be outdoors more will have a positive impact on your well being. Do you have a patio, balcony, or even just a lawn chair? Why not take dinner outside tonight! Even at the end of the day when all we want to do is enjoy dinner and relax, you can find the time to get outdoors. If the weather is nice, you could workout outside instead of in the gym. This will give you the chance to switch up your workout routine! Exercising outside can be much more exciting than the gym because of the fresh air and scenery. It could allow you to experience new things while also getting a workout, such as hiking a mountain trail. Sometimes that mid-day grogginess can leave us feeling a lack of concentration. If you are feeling unproductive, take a moment to leave your desk and take a walk around the block to get your blood flowing. A short mental break with some fresh air will make you feel refreshed and ready to finish the day. Often, we are so used to jumping in our cars we don’t think about how easy it would be to just walk. If you are able, errands are a great excuse to find the time to get outside. If the bank, store, or post office is just down the road, consider walking there! Although movie nights spent indoors are fun, there are plenty of other things we can do with our family and friends that will get us outside. How about going camping, or even just having a campfire? You could move your weekly coffee date outside to a table or to a park trail, visit the farmers market, or relax in a hammock instead of the couch. Take advantage of your weekends and free time! It’s easy to let our weekends slip away from us, but by planning ahead of time we can make sure we spend a free day outdoors. One final thought- At Keep Blount Beautiful, we believe our community should be well taken care of and appreciated so it can be enjoyed by all. When you are spending time outside, leave no trace! Be sure to dispose of your trash in a trash can and always respect wildlife. Keep Blount Beautiful (KBB) is accepting nominations for the 2019 BRAVO! Awards! What are the BRAVO! Awards? These awards praise local businesses, organizations, and public property for their landscaping and beautification efforts. KBB also recognizes properties that have creatively re-used/re-designed an existing building and the sustainable stewardship of properties in Blount County. Nominations are open to the public and based on the three award categories below. BRAVO! Beautification: This award is given to properties for their landscaping and beautification efforts. The landscaping must be mature and add improvement to the site. Reuse/Redesign: This award is for a property that has creatively reused or redesigned an existing building. The remodel must be complete. Sustainable Stewardship: This award is given to a business or organization that strives to incorporate sustainable business practices or policies, and/or renewable, sustainable, or energy-efficient spaces. Examples of Sustainable Stewardship include businesses and organizations that have a recycling program, practice effective stormwater management practices, or have sustainable workplace policies such as banning disposable cups and bottles. Other examples include businesses and organizations with sustainable building features such as large windows, energy efficient lighting, water efficient fittings, solar panels, or sufficient green space compared to paved space. The BRAVO! Awards will be announced at the annual award luncheon on June 6th. This event is invite-only. KBB will announce award winners to the public after the luncheon. We look forward to your nomination! Nominations are due by May 3rd. Private residencies are not considered for any award. Nominate a BRAVO! What is the Great American Cleanup? The Great American Cleanup is Keep America Beautiful’s 100-day community improvement program to encourage people to take action to improve and beautify their community. Keep Blount Beautiful celebrates the Great American Cleanup season with many events so YOU can help make Blount cleaner, greener, and more beautiful. The goal of these events is to encourage residents in Blount County to become engaged with their local environment and strengthen their community pride. See below for the full event schedule. For more information and to sign up, visit our website, click on the event links in the schedule below, or contact the office at 865-681-4809 / keepblount@gmail.com. Don’t forget about Litter Committee! Our monthly Litter Committee will continue through the Great American Cleanup. Join us the first Wednesday of each month from 4-5pm. Visit our website for date and location information. Keep Blount Beautiful has all the supplies you will need to perform your own group litter pickup. Let us know if you would like us to help you plan something for your group! Old electronics? Don't throw them away! As technology continues to advance, new models of tv’s, cell phones, and computers come out every year. For the majority of people, everyone wants the newest model, with the newest gadgets and features. That old computer is now probably useless to you as you open your sleek new laptop, but what should you do with the outdated technology? Instead of throwing your unwanted technology in the trash, which puts toxic waste in landfills that can affect the local environment and community, consider electronic recycling. Recycling your old computer can have numerous benefits such as conserving natural resources, supporting your local community and can even help create jobs! When a computer is recycled, it reduces the need to create new materials for new products. Parts off of older models can oftentimes be reused such as plastic and glass, thus reducing the amount of plastic and glass needed to create new computers. Recycling your old computer means it can be refurbished and given to those in the community who might not have the financial means to acquire new computers. Schools, low income families, students, libraries and charitable organizations could utilize and benefit greatly from these donated computers. Just by changing how you dispose of your old computer, you can help provide technology to those in need in your community! Lastly, electronic recycling can help create jobs. When electronics are recycled and cannot be refurbished or reused, they are sent to a local electronics recycling plants to be processed. The more people in the community recycle their old computers and electronics, the more people needed to operate the recycling plant, creating jobs. For those old computers and electronics sitting around at your house, consider recycling them. By doing so, you’ll benefit the environment, your community, and leave you feeling good knowing you’re doing your part to make a difference in your environment and community! How does the landfill work? The words ‘landfill’ and ‘dump’ are often used interchangeably, but they are actually two very different things! A dump is a place where trash is put illegally, causing many environmental hazards and a huge eye sore. A landfill is a complex system of burying trash that is safe and legal. All of the trash in Blount County is sent to the Alcoa/Maryville/Blount County Landfill. Once you throw something away in your home, chances are you don’t think about it again. However, that is just the beginning of the journey. After the garbage truck picks up the trash from your curb or parking lot, it is taken to the landfill. When entering the landfill, trucks drive over a large scale to be weighed. The truck then drives to the cell that is currently open in the landfill to dump the garbage, and a big tractor drives over the garbage to compact it. The trucks then drive over a scale when exiting to be weighed again. The difference in weight determines the weight of the garbage that was dropped off. It costs $50 a ton to put garbage in the landfill. Each day, 250-300 tons are buried! 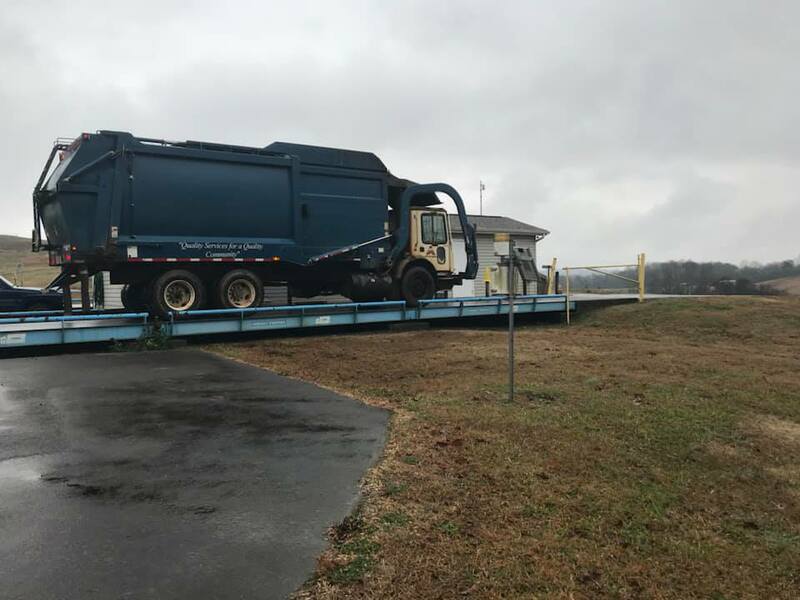 When entering the landfill, trucks must first stop at the scale house to be weighed. A landfill cell is a portion of the land that is used to occupy waste. The cells are made up of layers of dirt and garbage. Once a layer of garbage reaches the height limit (about 10-15 feet), a layer of dirt is placed on top before starting a new layer of garbage. Each night, the exposed layer is covered with thick, heavy plastic to keep everything in place and the animals away. In addition to the cells reserved for regular, household garbage, there is a cell reserved for demolition waste. This waste includes old furniture and construction materials. Each day, about 100-175 tons of demolition waste is dumped into the landfill. Demolition waste is kept separate from household waste since it is much cheaper to bury, mainly because no leachate system needs to be installed. Leachate is the liquid that garbage creates that needs to be drained out of the landfill and cleaned. A collection system catches the leachate in the cells holding household garbage. The leachate is sent to a treatment plant to be cleaned before it is sent back into the environment to avoid pollution. The other thing rotting garbage produces is methane gas- which smells horrible! However, at the Alcoa/Maryville/Blount County Landfill there is a Methane Gas to Energy Collection System that captures the gas and recycles it into energy. Since the landfill has a system of capturing the gas, there is no smell! Methane produced by garbage in the landfill is captured through gas wells, hooked up to a generator to make electricity, and sold to TVA. The Alcoa/Maryville/Blount County Landfill has been in operation since 1974 (43 years). It is estimated that there are about 50-60 years left until the 262 acres of land is filled. How can we make sure the landfill lasts as long as possible? Around 20 years ago, the landfill received 100,000 lbs of garbage a year with a population of 80,000 in Blount County. Currently, the landfill receives 80,000 lbs of garage a year with a larger population of 124,000. Practices of reducing, reusing, and recycling help extend the life of our landfill so it can last as long as possible. What do we do once a landfill cell is full? When a cell in the landfill is full, grass is planted on top and it appears as a large hill. Permanent buildings and structures cannot be built on a capped cell because there is no strong foundation; when the trash starts decomposing, the ground will start to sink. Alternative uses for capped landfill cells include sports fields and walking trails. At the Alcoa/Maryville/Blount County Landfill, a full cell is now a small airfield for the Blount County Model Aviators. Trash Convenience Center: residents are welcome to drop their garbage off at the landfill rather than use a garbage service. Garbage fees depend on the weight of the trash. Electronic and appliance recycling: Since electronics and appliances are hazardous and cannot be buried in the landfill, the landfill accepts them for recycling. Contact the landfill for pricing. Tire recycling: Tires cannot be buried in the landfill, but the landfill also accepts old tires for recycling. 2018 was not a great year for the environment. We experienced powerful hurricanes, raging forest fires, and rising sea levels. Our individual choices are impacting the entire planet. This is not a shocking revelation, but it needs to be said, repeatedly. The new year is a perfect time to reevaluate and modify your lifestyle so you can be more eco-friendly. We have some great new year’s resolutions you can try out this year. Okay, this is certainly not breaking news, but it is still worth mentioning. Hopefully, by now you have kicked your disposable plastic water bottle addiction, it’s 2019 move on, it's done. BUT, have you realized how many everyday items are in plastic containers. You know what I’m talking about, right? That produce that comes in a plastic bag, or is in a plastic box or is wrapped in plastic film. Bad, straight up bad. This year when hitting up your local grocery store buy the items that are plastic free, or at least have the smallest amount of plastic. Organic material: trash or plant food? Are you throwing organic matter in the trash? Compost it. The biggest contributor to landfills is food waste; the EPA reports 22 percent of landfill intake is food waste. Composting is the recycling of organic material back into the soil. You don’t need to have a great big garden to compost. Composting is great for trees and shrubs you likely have in your yard. If you have access to some dirt and a shovel you can probably do this. Easy peasy. 2019 is the year y’all start composting, I can feel it. But, how do you get protein? Ah, the question I have been getting my entire adult life. I am no doctor, but I can tell you with certainty that cutting out or reducing meat from your diet will be okay. The meat industry is a BIG contributor to global warming. Look, meat is neat. If you want to wrap a hot dog in deli meat or whatever, you do you. But, maybe just not every day. Maybe your meat days are like Wednesdays and weekends. You could do that, right? If you ask me spaghetti pairs with a nice leafy salad better than a meatball. So, when preparing a meal think does this need meat? Ham sandwich? Yea, it needs meat. Salad? Nope, skip the chicken. If you go out to dinner and there are only two veggie options and they both sound terrible. Alright, get the burger. Holiday, birthdays, anniversaries, dinner with grandma. Eat what you want. Aren’t you hungry? Don’t you think a vegetarian diet is boring? So, do you just eat super healthy? No, no, and uh nah. Vegetarians eat a wide range of food. Including popcorn and beer, which are personal favorites/staples in my diet. 2019 is the year folks. You can make a difference by making good choices regarding the environment. Your decisions matter, they are impactful. Again for the people in the back… Your choices impact the planet. Environmental education is one of the most important tools we have to teach students about how their actions have an impact on the world around them. Teaching is arguably the most important thing we do at Keep Blount Beautiful. If you are not a teacher in Blount County it's not likely you know what it’s like to have KBB in a classroom. Our goal is to educate by getting students involved. Personally, my favorite presentation is Fred the Fish. Fred the Fish is an interactive story involving a fish made from a dish sponge, a clear container with water, and fake pollutants. We tell the story of how Fred travels down the Little River and goes through polluted areas. Students take turns adding pollutants to Fred’s water. They get to see how their actions impact Fred and his environment. We allow them to comment on how the brown sugar we pretend is dog poop and other pollutants affect Fred’s health and happiness. Classroom presentations are not the only educating we do at KBB! We take students on field trips to the Blount County Landfill. It is really a neat field trip for kids. They see how the landfill operates and get to learn from the trash experts at KBB. We also love to invite classes to hang out with us at our EcoCenter to play our recycle relay race and learn more about waste and recycling. At KBB we also think it is incredibly important for students to be involved in beautification projects and litter pickups. A great way to teach kids that littering is bad is to have students go pick it up! During the warmer months, we work with students to pick up trash on their school grounds. There is plenty of litter to pick up, especially near football and baseball fields. Seeing a campus before and after a litter pickup allows students to feel pride in their school and accomplishment for their work. What Do I Do with Unused Paint? This is the question we get asked the most often at Keep Blount Beautiful. And it’s an important one! Let’s say you’re cleaning out your garage, or maybe you have some paint left over in the can after a project. Either way, you want to find out a way to get rid of it. Chances are you already know or assume this fact: If you have unused paint, it cannot simply be thrown away. When disposing paint, the first thing to determine is if it latex-based paint or oil-based paint. Latex paint is not considered household hazardous waste because it is water-based. However, latex paint needs to be dried out before it is thrown away so it will not seep into the ground. If there is under an inch of paint left in the can, it should dry out in a couple days when the lid is left off. If there is more pain in the can, stirring an equal part of cat litter into the paint will help it dry out faster. Sawdust or shredded paper can be used as an alternative to cat litter. If there is too much paint in the can to add equal parts of a hardener, some of the paint can be poured into a plastic or cardboard container that will not leak. In addition to these materials, there are also paint hardeners that can be purchased at the hardware store. Once the paint is dried out, it can be tossed in your normal household trash. Note: Latex paint will NOT be accepted by the Blount County Recycling Center. ONLY oil-based paint will be accepted. If you have large quantities of paint and it is still in good condition, it can be donated to the Habitat for Humanity Restore and will be purchased by someone who needs it. The Restore is located at 548 N Foothills Plaza, Maryville. You can avoid having a lot of leftover paint by only buying what you need! There are plenty of online calculators that can determine the amount of paint you will need according to the area of what you are painting. Keep Blount Beautiful received a $5,000 grant from The UPS Foundation as part of the 2018 Keep America Beautiful/UPS Community Tree and Recovery Tree Planting Grant Program. Keep Blount Beautiful’s grant, to be used for The Kids Keep Blount Beautiful program, is one of 19 grants totaling $100,000 distributed throughout the country to Keep America Beautiful’s community-based affiliates. It’s estimated that the grant recipients’ projects will result in more than 1,200 trees being planted in support of local tree-planting initiatives. The Kids Keep Blount Beautiful is a campaign designed to give young Blount County citizens a sense of ownership over their community by providing them the opportunity to participate in community greening and beautification projects. The campaign aims to address both the lack of environmental education in the local schools and the need for community greening with native plants and trees. With the funds from the UPS grant, Keep Blount Beautiful will perform native tree plantings at two Blount County Middle Schools, Carpenter’s Middle School and Eagleton Middle School. The trees will serve as one step in a long-term campus revitalization plan. “Ultimately, a generation raised with environmental values and a sense of community pride will have a significant positive impact on the future of Blount County. Through this project, we want our middle school students to understand the positive effects of beautification and the importance of taking care of our community, as well as improve the native infrastructure of the campus with native species,” said Brittney Whipple, Executive Director at Keep Blount Beautiful. Since 2011, Keep America Beautiful and The UPS Foundation have worked together to plant more than 11,200 trees throughout the country. The collaboration with Keep America Beautiful is part of The UPS Foundation’s global tree-planting initiative intended to help sequester levels of carbon dioxide through strategic plantings; emphasize the importance of native tree planting; or produce fruit from fruit trees for local consumption. The UPS Community Tree and Recovery Tree Planting Grant Program is one element of The UPS Foundation’s commitment to fund the planting of “15 Million Trees By 2020” in urban and rural areas around the globe. Last year, the program funded the planting of more than 2.7 million trees, bringing the number of total trees planted to over 12.5 million – 84 percent to its goal. Additionally, this past year two new countries – Austria and Nigeria – were added to the program. UPS has now planted trees in 56 countries around the world. Recycling is great, but it is not an end-all solution to fighting plastic waste. After you toss your plastic in the recycling bin, it has a complicated journey ahead of it. Plastic recycling is not a perfect system, not all plastic is equal. There are various qualities and grades of plastic that must be sorted in order for recycling to take place. Through errors in plastic sorting systems, thousands of pounds of plastic end up in the landfill every year. So, how does plastic stack up to other recyclable materials? It’s not great. Glass and aluminum can be recycled over and over again, without losing quality. Plastic can only be recycled once or twice before it is completely useless. Also, plastic recycling is alarmingly low. Only 10 percent of plastic material generated in the US is recycled. Glass is 80 percent recycled. I’ve said it before and I’ll say it again. Consumer habits regarding once-use plastics are killing our planet. Plastic bottles, coffee cups, straws, grocery bags. All bad. Cautious consumption can greatly reduce the demand for plastic production. Wildlife ingest and get caught in plastic, especially marine life. Even though plastic recycling has many faults it is still very important to recycle. Plastic water bottles won’t ever be a water bottle again, but they may become a park bench, or carpet, or even clothes! At KBB we like to refer to the Three Rs. Reduce, reuse, and recycle. Reducing and reusing are far more beneficial to the planet than recycling. But, don’t stop recycling! Remember to reduce your consumption habits and reuse that plastic you already have. Now that the temperature is dropping, it is time think about how you can be more sustainable this winter. It takes a lot of energy to heat your home during the winter months. TVA reports a spike in energy usage every year starting in December. There are plenty of ways to conserve energy and save money on your electric bill this season! The sun will heat your home while you are away during the day. Take advantage of the free passive solar energy! On a sunny day this can really make a big difference. Just be sure your windows don’t let cold air in. Feeling chilly at home? Before you turn the heat up think about what you are wearing. Trade the t-shirt for a sweater and see how much warmer you feel. Bundling up will save you from turning up the heat a few extra degrees. If you aren't home, why crank the heat? But be careful, constant cooling and reheating will actually raise your electric bill. It’s best to change the thermostat no more than 8 degrees at a time. If you spend a lot of time in one room, try heating that room with a space heater instead of heating the whole house. You can keep your thermostat at a lower temperature and still be perfectly warm. You won't be opening your windows in the winter, so you can just seal them for insulation. Many homes have windows that leak cold air. If you haven’t done this before, it is really easy. Just head over to a hardware or home improvement store and pick up window insulation kit. Once it warms up in the spring you can just peel off the insulation and open your windows again. What is my favorite holiday this time of year? That's right, International Mountain Day. Out here in East Tennessee we really do love our Smoky Mountains. International Mountain Day falls on December 11th. It is a much deserved holiday to celebrate and draw attention to the importance of all mountains. Maybe you haven’t heard, but mountains are a really big deal. Over half of the human population relies on mountains for food, water, and clean energy. Mountains make up about a quarter of all land space on earth. AND mountains provide about 70 percent of the world's freshwater. But, I have bad news. Global Warming is doing some serious damage to our mountains. In most places in America we are incredibly privileged, we turn on the faucet and clean water comes out. Without mountains we would be seriously thirsty. Mountains are basically nature’s water towers, storing water in ice and snow. It is so important to recognize that fresh mountain water is a finite resource that should never be taken advantage of. Without emphasis on good environmental practices, we can say goodbye to clean freshwater. I am talking about a global water crisis. Global Warming is bad-news-bears for every ecosystem on the planet, but it not the only reason mountains are in danger. If you don’t know why that is bad, let me fill you in. Water runoff comes down the mountains and enters the water systems below. Without proper vegetation coverage, a heavy rain will cause erosion and mudslides. As all that rainwater comes down the mountain, unimpeded by vegetation coverage, it brings everything with it. That includes fertilizer and insecticide. Those substances pollute all of the lakes and rivers in the watershed. Contaminated water leads to an increase in the spread of diseases. Estimated 840,000 people die every year from unsafe drinking water. So who can fix some of these issues? No seriously, World Health Organization (WHO) can help fix these issues. WHO is responsible for setting water quality regulations, and testing water quality. WHO’s water quality standards protect public health and reduce risk of health issues caused by poor water quality. WHO is working on the water quality issue, but there is only so much one organization can do. You can help too! Celebrate my favorite holiday by focusing on reducing your environmental impact and carbon footprint. Not just on International Mountain Day, but everyday! On a typical day most of us wake up, take a shower, have a cup of coffee, then hop in our car and head to work. It seems like an incredibly harmless routine. The truth is, many of the simple things we do everyday have a harmful impact on our environment. But don’t worry! You don't have to throw out your entire morning routine, you just have to make some adjustments. Be honest, how long are your morning showers? I get it, I really do. Nothing better than a hot shower, especially on a chilly winter morning. I’m sure I am not the first person who has said that long hot showers are a serious conservation no-no. Even as a grown adult I can still hear my dad’s voice shouting, “Hurry up, you are wasting water!” Turns out he was right. A standard shower runs 2.5 gallons of water every minute. The reality is we all let 2.5 gallons of water go down the drain before we even get in! That is some serious habitual water waste. Unfortunately, wasting water isn’t even half of the problem. It takes an immense amount of energy to heat the water for your shower. In an average American home, the water heater works hardest for the shower. So, at this point I have convinced you not to shower, right? Do not quit showering, that’s gross. But there are some things you can do! Get a new shower head: Your shower head is probably spitting out way more water than you need. Look for an EPA-certified shower head to cut back on water waste. Turn the heat down: Give your water heater a break. Don’t crank the hot water all the way up. Get out of the shower: Has it been 10 minutes? 15 minutes? Okay you are done, you are clean. Get out. Okay now that you are squeaky clean, it’s time for that morning cup of coffee. People are drinking more coffee than ever, we are busy and tired we need our coffee. Basic economics would tell you that an increase in demand for coffee leads to an increase in production of coffee. So how is the coffee industry doing that? Through the process of deforestation, water contamination, and damaging soil quality. So, none of that is great. And now that you spent so much time in the shower you have to take your coffee to go. 16 billion disposable coffee cups are used every year. That 6.5 million trees! Alright coffee lovers, here is what you have to do. Buy sustainably sourced coffee: Look for shade grown-coffee. This growing technique has been found to be more environmentally friendly. Use a reusable coffee mug: Buy one, use it forever. Plus, reusable travel mugs will keep your coffee hot. Drink less coffee: Easy or not, drinking less coffee will help protect our planet. Is your commute harming the earth? Probably. There are 230 million cars on the road in the U.S. and not everyone is driving a Tesla. Car pollution is a top contributor to global warming. Vehicle emissions in the U.S. make up one-fifth of all warming pollution. Driving impacts more than the air, it also causes harm to the water and soil! Runoff from the roads ends up in our streams, impacting our water and soil quality. ALSO, people are more likely to litter while in a car. I don’t know if you have heard, but us at KBB really hates littering. Help the earth out and drive less. Share your commute: Catch a ride to work with a coworker. Saves on gas and money. Walk or ride a bike: Not going too far? No one said you have to commute in your car. Drive an environmentally friendly car: Next time you are in the market for a vehicle, opt for something smaller, or maybe even a hybrid car. It is always important to consider how our actions are impacting the environment. Adjust some of your daily habits to protect our planet. America Recycles Day- What is it all about? On Saturday, November 3rd, Keep Blount Beautiful (KBB) will be hosting its annual America Recycles Day collection with the help of many different partnering organizations. This drive-through event, located at First Baptist Maryville (202 W Lamar Alexander Pkwy) will provide Blount County residents the opportunity to conveniently drop off many hard-to-recycle items so they can be disposed of properly. America Recycles Day is a Keep America Beautiful Initiative to promote and celebrate recycling in the United States. Each November, affiliates all over the county host events to encourage and increase recycling. Keep Blount Beautiful likes to celebrate America Recycles Day by partnering with organizations that recycle or reuse nontraditional items to provide a convenient way for residents to clean out their home and get rid of these items responsibly. E-Cycle of Knoxville has been a dedicated sponsor in both KBB’s America Recycles Day collection as well as its Earth Day Recycling collection in the Spring. They collect many items including TVs, monitors, cell phones, home electronics, small appliances, and computers at our events. Responsibly disposing of electronics is important to the health of our planet because they contain many hazardous materials that can leach into our ground, impacting our food and water supply. When they are disposed of correctly, the different parts of the electronic, including plastic, glass, and metal (such as copper, tin, aluminum, and gold! ), can be separated and recycled, and many parts can be reused in new electronic products. Learn more about E-Cycle of Knoxville. KBB also likes to provide the opportunity to dispose of secure documents that contain personal information and therefore are not safe to simply throw in your regular recycling bin. This year, Spectra Recycling will provide secure bins to collect secure documents. These documents will be safely and securely transferred to their facility and then shredded to be made into new items, such as toilet paper. KARM has also been a dedicated participant in both of KBB’s annual recycling events. They provide large bins for residents to drop off clothes and shoes that are still in good condition for others to use. Donating clothes that are still in good condition is a great way to reuse rather than throw away. My Frugal Home regularly participates with KBB’s annual recycling events as well. They collect an array of items that they can reuse for different purposes. This year, they will be collecting chandeliers, fabric, hardcover Reader’s Digests, lighting globes and sconces, used candles, and coffee mugs. If you have any of these items, they do not have to take up space in the landfill; the creative minds that make up My Frugal Home will put them to good use. Learn more about My Frugal Home. The Blount County Fire Department will be collecting children’s coats that are in good condition. These coats are for their Coats for our Community program to support those in need of coats this fall and winter season. This is another great example of extending the life of an item by reusing it. Learn more about Coats for our Community. The Lions Club of Maryville will be collecting eyeglasses to redistribute around the world. If you no longer need your eyeglasses, someone else might! Learn more about Lions Club eyeglass recycling. Year round, KBB is dedicated to keeping residents up to date on recycling information in our county. For reference on where many recyclable and hazardous items can be disposed of, please visit our website KeepBlountBeautiful.org. Information on Household Hazardous Waste Disposal. Information on Recycling in Blount County.